Though generally I prefer to make spicy prawn curries and the crisp fried form of prawn, but I just can't resist adding them in a pizza topping. 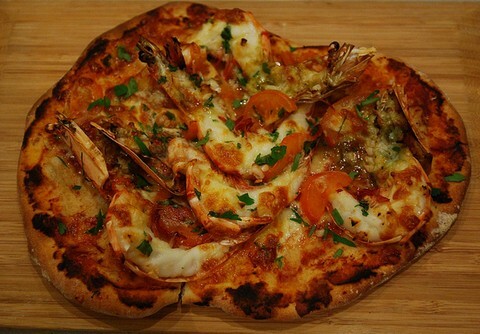 How about a tiger prawn topping for your next pizza recipe? Let's make one flavored with tangy and spicy seasoning ingredients with a juicy layer of prawns. If tiger prawns are not available, you can use a local variety too. One can also add squid or fish eggs in the topping. Keep the pizza base slightly thick to get the best results. Feel free to sprinkle dried herbs or chili flakes on top of the piping hot baked pizza. If you love a more colorful topping, add bell peppers or broccoli in it. So, fire up your oven and get ready to make this unique pizza preparation. Savor this delicious tiger prawn pizza flavored with tangy tomatoes and select seasoning ingredients which gives it a pungent and mouthwatering taste. Sift semolina and wheat flour for half a minute and make a well in between. Mix dried yeast with 3 to 4 tsp of water and add in a bowl with 3 tsp extra virgin olive oil and castor sugar. Stir and mix all the ingredients with a spoon for about 2 minutes. Add it in the well made earlier in the first step. Cover it with the flour and mix gently with your fingers. Slowly add lukewarm water and knead it into a smooth and elastic dough base. Cover the dough with a damp cloth piece and keep in a warm corner for an hour. Meanwhile, add 2 tsp extra virgin olive oil and salt in buttermilk and stir it briskly for a few seconds. Add all the prawns in it and keep aside for about 15 to 20 minutes. After an hour, roll the pizza dough with a slightly thick base while dusting the surface with flour. Start with sprinkling grated processed cheese on the pizza base. Follow it with addition of both sliced tomatoes and prawns drenched in butter milk. You can use the left buttermilk in a curry preparation. Season with white pepper powder, onion powder and dried herbs powder. Bake in preheated oven at 400 degrees for about 15 minutes. Garnish with chopped coriander leaves and serve with a beverage. 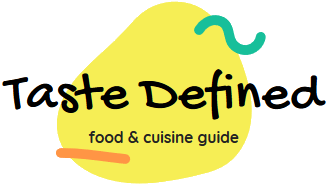 Copyright © Taste Defined. All Rights Reserved.